I guess I was an early adopter of satellite navigation. Over ten years ago I had a navigation package from TomTom (or Palmtop as they were then called) installed on my Psion 5mx and through a complicated series of cables hooked it up to a Garmin eTrex and powered the whole thing in the car. It wasn’t bad, but it was a bit clunky, had no voice instructions, took an age to recalculate if you went off route, and had a number of mapping errors – Micheldever Station was marked on a railway bridge half a mile from the station for example. From there I progressed onto stand alone units, sticking with Garmin as my handheld GPS units were Garmin’s and could share desktop software and maps. Currently I’m running a Garmin Nuvi with full maps of both Europe and North America and an FM traffic receiver, and that has served us fine. Last week it turned out that both Beth and myself needed the satnav as both of us were going to be going to unfamiliar places. Obviously we didn’t need a second satnav, but since my iPhone has a nice little GPS on it I thought I’d take a look at the options. Conveniently PCPro have just done a group test of satnav applications, and TomTom came out top of the pile. Since one of my biggest bugbears with the Garmin Nuvi is the fact that the FM traffic often reports traffic jams when it’s too late to avoid them and I’d heard good things about the TomTom Live Traffic service I thought I’d go for the TomTom application despite it being one of the premium priced satnav products in the app store. First off, it is a nice little app, slightly confusing to navigate around until you get used to it, but fine on the road. The Live Traffic service is impressive, and indicated traffic pretty consistently, and the routing based on actual road speeds certainly allowed it to pick routes which matched much more closely with short cuts I knew about rather than the more obvious routes the Garmin would take. 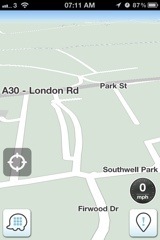 However there is a really big problem, even ten years later, there are still problems with the TomTom maps. Whilst Micheldever Station is now in the right place, other things aren’t. For example a local petrol station whilst close to the right spot is the wrong side of a road junction, speed limits are wrong, and whereas my Garmin will guide me right to my front door, even saying on which side of the street it is the TomTom app can only manage to get me to the street. There are more serious problems too. We live adjacent to a military base, and whilst there are roads that go across, they are closed with security guards on the gates – the TomTom map doesn’t reflect this. 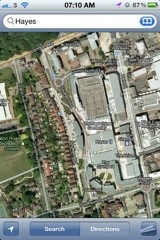 The map is also just plain wrong in places, a major example being around the Atrium in Camberley. Below are three screenshots from my iPhone. The left hand one is from the Maps application showing an up to date satellite picture of Southern Road down the side of the Atrium. 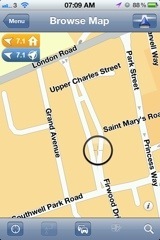 The second shot is from TomTom, the only app of the three that costs any money. The third is from Waze, the community navigation app that is a free download. Looking at it you’ll see that the TomTom version is very inaccurate. It incorrectly shows Southern Road running all the way to Southwell Park Road, and running all the way to the A30 at the other end – it doesn’t. Instead it is blocked at both ends with an access road a short way down. There is also an entire roundabout missing which in the TomTom version is replaced by a pair of junctions. Whilst the Atrium is pretty new, it’s been built for a number of years, and the road layout TomTom has doesn’t bear much relation to what is there now, nor to what was removed when the Atrium was built. The third screen shot shows the layout according to Waze which is correct, and the layout is also correct on my Garmin Nuvi. It is fair to say I’m not impressed. TomTom, much like Waze has the ability to report map errors, but with Waze I’m not paying a premium price. Garmin have up to date maps, is it too much to expect that TomTom could do the same? Suffice to say my experience with TomTom is not going to have me switching. Whilst I am impressed with the Live Traffic it is pretty fundamental to have accurate maps, having found a number of errors locally where I know the area, how can I have the confidence travelling in a strange area that the TomTom is correct? For my birthday last week, Beth got me a Garmin i2 SatNav system. Before anybody starts reading anything into that, about Beth not wanting to navigate whilst I’m driving, I did actually ask for one! Although I don’t go out on the road for work often, it is useful to have a compact, reliable satnav system to find customer sites and the like. I didn’t want anything fancy, so the i2, with it’s simple black and white screen, and only about the size of a tennis ball is perfect. Coupled with that, all the reviews I’d seen of the i-series systems were positively glowing with the units beating many of the more expensive and flashy models in terms of reliability and accuracy. Anyway, yesterday we went off to a family gathering at my uncles house in Little Chalfont, so I thought I’d give the unit a test run on a route that I knew. The first hiccup we came across is that whilst it can pretty well direct you into our drive with no trouble, it had problems with my uncles street where all the houses have names rather than numbers. In the end it gave me three waypoints at various points in the street, and I took a guess at what was roughly the right one. That solved, off we set. The first disagreement I had with it’s choice of route was getting to the motorway. It looked to be trying to take us to the M4 at Winnersh, however I tend to go on at the next junction along at Reading, because thanks to the waits at several sets of traffic lights going round through Winnersh it seems to work out as a better route. At the point I diverged from the route, the unit just recalculated the route. Initially it tried to make me go all the way around the next roundabout (I had already set it up not to do any U-turns), but after that it flipped over and followed the same route I’d use to get to the motorway. Once on the motorway, there really wasn’t much choice about the route, just along the M4, and then onto the M25. On the M25 we got probably the most amusing moment, which was thanks to the speed camera warning database I had loaded in. Essentially this means that that unit will issue a warning as you approach a speed camera location, and then raise an alarm if your speed is above what is recorded as the speed limit at the camera. Whilst with the variable speed limit on the M25 it isn’t possible to raise the speed alarm, it does include which gantries on the motorway actually have real cameras on them. What was amusing was as we were driving along the motorway the variable speed limit was on, and at the precise moment that our unit beeped to alert us to the upcoming camera, another four or five cars in various of the other lanes close by suddenly put their brakes on, all in unison – showing up all the other people who were using the database! Anyway, coming up to junction seventeen we had another example where the satnav was no substitute for local knowledge. The unit indicated that we should go off at junction seventeen, and then looked to be directing us up the back roads through Heronsgate. Whilst on paper that route appears quicker, I know that all the roads up that way are pretty narrow, and that it is a lot quicker to go the mile or so to the next junction, and head along the A404. So I drove on past the A412 juntion, and the unit dutifully recalculated, and agreed on the route as far as the edge of Little Chalfont. However at the edge of the village, it again told me to turn off down one of the lanes, despite the fact that it was a lot easier to drive on into the centre of the village and turn straight into the other end of their street. Again I ignored it, and once past that point it recalculated to the route I would expect. On the way home I thought we’d go the scenic route, and take the A404 as far as Amersham, and then back through Beaconsfield, and down into the Thames Valley. From there we headed along the north side of the river through Marlow, eventually heading south at Henley. Initially it stopped trying to get me to head back in the other direction quite quickly, before we’d even got to Amersham, however that was only because it had found another route from Beaconsfield down to Maidenhead. Once I turned away from it’s route in Beaconsfield it kept coming up with requests to go around roundabouts, and even at one point driving in a loop around a triangular junction just outside Marlow in order to try and get back to the A404. However, once we’d got about halfway between Marlow and Henley it eventually opted for a route through Henley. However, that wasn’t the last time it tried to go another way. Within a mile of our house, it strangely decided it would be quicker to drive past the turn, and then go round the village bypass, including two roundabouts, and in the other end, rather than take the much quicker route through the estate. I assume that the reason for that is that since the bypass is an A road, the algorithm believes that it will be a quicker road, without factoring in the time it would take at each roundabout. So the conclusion of the test run is that whilst it always knows where you are, and always recalculates the route without complaint (unlike a human navigator), it really does come up with some weird routes. As another example, nobody could understand last week why the coach driver took us to the M4 straight through the middle of Wokingham on a busy Saturday morning. However, put a route to or from almost anywhere to the east of Reading on the M4 and Finchampstead, into a route planner and almost always they’ll route via the Bracknell end of the A329M through the centre of Wokingham, because all the roads through the town centre are classed as A-roads. Definitely shows that a current satnav system is no substitute for local knowledge. Having said that, I’m still really pleased with my new little Garmin. It’s got a simple to use interface (no messing about with a stylus), has a decent GPS, which includes WAAS support and can take maps from the standard Garmin ranges. The lack of a colour screen is no loss, and of course makes it cheaper, so for a little over Â£100 you get an address level navigator, that is small enough to remove from the car and hide away when not in use, just the kind of thing I was looking for.